Oven Roasted Tomato Sauce – easy! If you’ve read my stove-top tomato sauce directions, you already know that I do not peel my tomatoes nor do I take the seeds out. I just blend up the tomatoes and call it good. Some might call this lazy. Shucks, I call this lazy. But this is one instance where being lazy works fine. You are very welcome to take off the skins and take out the seeds if you prefer. I never measure or weigh my tomatoes, but in doing a little searching on the internet, I find that it takes 35-45 pounds of tomatoes to make 7 quarts of sauce. How many tomatoes equals one pound? It totally depends on the tomato. What kind of tomatoes can you use to make sauce? Whatever kind you want. We always plant a variety of tomatoes and throw them all together into our sauce. Because tomatoes are very acidic (especially heirloom tomatoes), I’m not terribly concerned about adding lemon juice to my sauce. However, if you feel more comfortable adding lemon juice for safety, you’ll want to use about 2 Tablespoons in each quart jar. 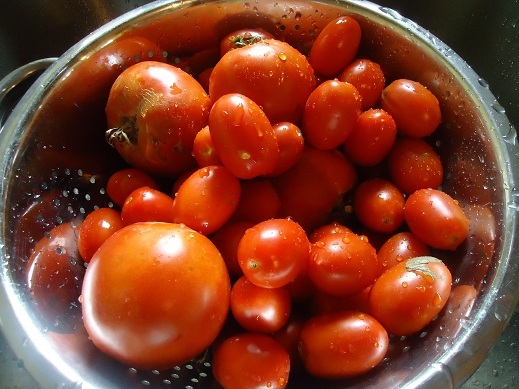 First wash your tomatoes (unless you enjoy the grit of soil from your garden…mmm). 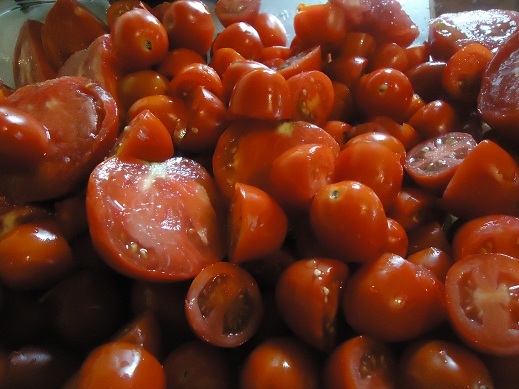 Next, cut up your tomatoes and throw them into a roasting pan or any large baking dish. I usually cut my larger tomatoes into fourths and my smaller tomatoes in half. 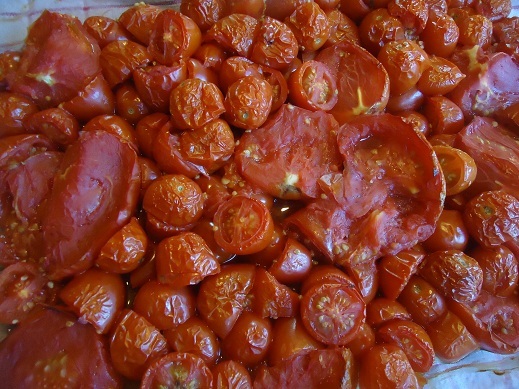 Place the container of tomatoes (uncovered) into a 350° oven for about 1 1/2 hours or until the tomatoes are all shrivelled up and are floating in their own juices. Run them through a strainer so that all you have left is the shrivelled tomatoes. Place the tomatoes in a blender until smooth. Or better yet!! Run them through a Victorio!!! Can them in a water bath (you can read more about this process here) for 25-30 minutes. Are you a canner? Have you ever tried making tomato sauce this way? I love to can tomatoes, but just peel them and process longer to eliminate the cooking process. They just cook in the canner. I LOVE home canned tomatoes for later use. I switched to this method this year, too, and it has made things SO simple! I do them at 400 for about 40 minutes, I don’t strain, and I just scoop the tomatoes (without the extra juice, which I leave in my roasting dish) straight into the blender. It is incredibly simple to churn out a few quarts of sauce at a time (or, as many as you happen to have ripe tomatoes for) this way!! Awesome! That sounds great and much easier :) Now when you drain the juice from the tomatoes do you keep the juice and add it to the pureed tomatoes? Also, when is the best time to add an italian seasoning? I’ve canned tomato sauce and soup – thanks to you! I’m looking foward to canning more soon :). And I need to plant more tomato plants, otherwise our sauce will not last/get us that long/much ;). No, I just keep the juice out, otherwise the sauce will be very runny. I would add italian seasoning to the sauce later when I’m making spaghetti or pizza, but you could add it after you’ve blended the sauce and before you can it if you want. Well nuts, turns out I did it the hard way! I love canning, and am definitely in the learning stages. But so far this year I have canned cherries, salsa, tomato sauce, pizza sauce, peaches, and tomorrow it will be pears. I just did a batch of stove top sauce today (along with one canner of beans and 3 of potatoes!). I will have to try this next time, even easier! I do not can,but have used this same method for fresh sauce. It was amazing! We love to add squash and zucchini as another simple way to sneak veggies. You can just chop them up and throw them in with the tomatoes as they roast. You will want to add lemon juice to your canning jars if you are canning the sauce, since the other vegetables don’t have enough acid to preserve them properly. If you freeze this instead of canning it (with the addition of squash, etc) would you need to add lemon juice? No, there would be no need for lemon juice if you freeze it. Yes, you can definitely freeze this instead of canning it! Thank you I will try this for sure. Things are changing so quickly for me! I just discovered that you can freeze sauce with the skins and seeds! But all that time on the stove to get it to reduce required some time commitment. We have a frost warning here tonight, but my tomatoes are covered, and I’m hoping to give this method a try with my remaining tomatoes! THANKS! Be careful canning tomatoes that have been exposed to frost. The drop below freezing changes the acidity of the tomatoes. They are ok to use, but that is one case where I would use the extra lemon juice (from a bottle, where the acidity level is assured). I did this this year for the first time! My reason, though, was that I had 4 bushels of tomatoes to process, & I needed extra room if I was going to get done any time soon. I could only cook on 2 burners at a time due to the size of my kettles, so I cooked down sauce on 1 burner, boiled water on the other burner (for blanching, because I peel all my tomatoes. ), & heaped my large LeCreuset pot w/ tomato chunks & put it in the oven. I cooked mine @ 250 degrees, though, (Since I’d never done it before, or even heard of it being done, I had no idea what temp would be best.) & stirred it about once an hr. I let it cook down for several hrs. & then combined it w/ the sauce on the stove. I’ve done this for years. I buy tomatoes when they are in season and freeze them ‘whole’ free flow. When I’m ready to preserve them, I take them out of the freezer put them in my baking dishes (with sides ofcourse) whole, turn on the oven and bake on slow heat until done. 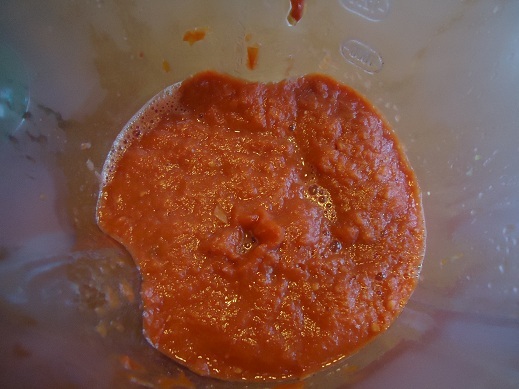 I then squeeze the tomato out of the skin into my food processor, heat the ‘sauce’ and then ‘can’ the whole lot (using overflow method) including juice (best bit). I use my dishwasher on the hot cycle to sterilize all my jars (I don’t put powder in ofcourse). Easy peasy! What? No boiling?! Sounds great. I’ve always done this, because I didn’t know better (and probably wouldn’t have embarked on preserving tomatoes had I been told I had to peel them all!). Got it from the book “Roasting” (love that book). She uses olive oil and high heat (500) to give them a “fire roasted” taste. I’m going to do what Hanneke says next time, though, squeeze them out of their skins (at that point, you can almost just lift the skins off). I vita-mixed mine before canning, but one of my kids is so turned off by the texture of the (tiny!) bits of skin in the sauce that he won’t touch it. I remember thinking that bushel would last us a year – summer’s not even over (not down here, anyway) and it’s already nearly gone! If you ran it through a food mill instead of a blender that would get rid of the seeds and the skins. and seeds go right in the food processor. an extra quart or two so end up breaking even on the cost of the powder. I hate to pour out any usable liquid from vegetables. You should be careful when canning anything with oil in it. You’re right, Angela, I should have mentioned that I freeze rather than can. And I’ll look into a food mill to appease my textures-sensitive kid, that’ll probably solve it without having to peel them all ahead of time. I really liked the roasted taste I got putting them through the oven. I read an article the other day that said the increasing prevalence of heirloom tomatoes in the 70s is actually why they started recommending that you add acid to canned tomato products. The thing with heirlooms is that while some may indeed be more acidic than their generic counterparts, others are indeed less acidic and can be really dangerous when canned without added acid. I just started something similar this year and we love the resulting sauce. Roast at 200 degrees for 6 hours. I’m lazy with the skins and seeds, too. I haven’t canned any of my sauce, just freeze it. I also do it with only 6-8lbs of ripe tomatoes as they come in from the garden. I’ve found I have a slow steady harvest rather than tons of tomatoes ripen at once. I start them on the stove to get them nice and soft, run them through a ricer then put it in a crockpot with a screen on top instead of a lid and put it on low overnight. I find this method really easy and produces a nice thick sauce. I freeze my sauce as I have lots of freezer space. I just tried a similar recipe yesterday. I cut the tomatoes, scooped out the seeds and then roasted them. I then put them through my sieve to remove the skins and then the recipe says to cook the tomato sauce for about 20 minutes, place in jars and then put them in a water bath. So, it looks like I could have skipped a couple of steps. You just left the seeds in the tomatoes and then roasted them and after they were roasted and blended did you run it through a sieve or did you just leave the blended up skins in the sauce? Nope, I just leave it all in. You can definitely run them through a sieve if you prefer, but my family does fine with seeds and skin left in. I am just jealous that you have tomatoes at all…they all pretty much fried in the heat this summer in Oklahoma. :( Love the idea…maybe next year! Chop up tomatoes (I left skins on but took seeds out: cut horizontally to do that more easily). Mix everything else and toss with 2 T olive oil. Spread all in baking sheet. Bake one hour. Puree everything (no need to drain). Can in hot water bath for 40 minutes. After adding the 2T lemon juice per quart. I found that 5x the recipe was 18 lbs tomatoes and I got 25 cups of sauce. I filled 8 quarts to just 3 cups. This would be a great recipe to get your kids involved! I pressure-can my tomatoes, too. Not only does it eliminate any fear of the acidity being incorrect, it’s much faster – 20 minutes (including vent time) versus 90. I did 2 batches the other night after work, something I can’t do in BWB. It’s not lazy to keep the skins and seeds, it’s just extra fiber! I run my tomatoes through my vitamix when I make juice and it pulverizes them so much you don’t even know they are there. I don’t have to skin them or run them through the food mill anymore, it’s so much faster. I’ve made sauce like this too but I freeze it, that way I don’t worry about the acidity and can add roasted peppers and mushrooms. It is the best sauce ever! I love to can as a way of preserving! I canned more than 400 jars last year and am already at 300 for this year. Last night I put up two batches of pear vanilla jam from Marisa over at Food in Jars. And I did a single batch of Yellow Pear Tomato relish. One of my favorite roasting recipes for canning is tomatillo salsa. I’ve put up more than 3 dozen jars of that this year. In addition to our own eating, I give tons of jars at Christmas and throughout the year as hostess gifts, thank yous, etc. 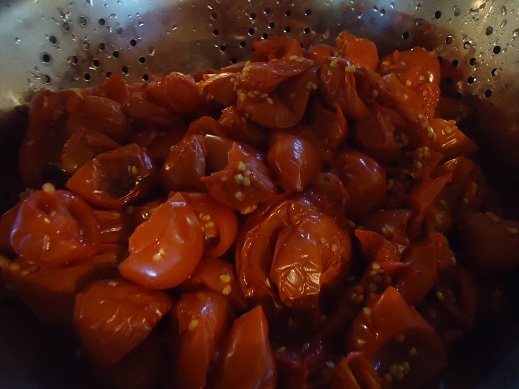 This week I did my first batch of dried romas in the dehydrator with a little salt. Very tasty! Looks like roasted tomato sauce is my next project! I did roasted tomatillo salsa this year too! It is so yummy! Wondering what to do with all the juice you strain off? Can that be canned too? Or do you just toss it? Yes, you can save it and use it as tomato juice for soup if you want! I have been canning my tomatoes and making sauce for years. I use the same method. I have canned whole tomatoes, chopped and pureed. I also strain the juice and can it for use in soups and stews. It is so much better than bought sauce or juice. My grandmother used to make homemade ketchup too. They didn’t throw anything away. I haven’t tried that one yet but would love to one day. Whoa – this is just too simple. Gonna have to try it with the tomatoes I just got from Azure. Woo hoo! Looks great and no splatter all over the stove-top! Hi, just wondering if you could crockpot them and then can? Too watery, I wonder? I picture them being too watery this way, mainly because the lid is on the crockpot and not allowing anything to evaporate off. Someone mentioned above that she uses the crockpot overnight but puts a screen on it rather than the glass lid. Just this year – after doing tomato sauce on the stovetop – I wondered if it would be better/easier to do it in the oven. I’ll definately give this a try next year. Since I don’t relish the thought of seeds or bits of skin in my sauce, I plan on running the drained, roasted tomatoes through the Roma food mill I begged my mom to get me for Christmas last year. :D It sure came in handy this canning season. Thanks for all your encouragement and tips on canning/freezing food stores for your family. Great article/post! I only do my sauce one way…the easy/lazy way…lol I take my washed tomatoes, blend them till the seeds are “gone” then pour the “sauce” into quart size freezer baggies then lay them flat on a cookie sheet and freeze. Taaadahhh! Tomato sauce…teehee Seriously, we use the bulk of our tomato sauce for soups, chilli, spaghetti etc. so having a “thinner” sauce is not a problem, it cooks down some as it simmers in whatever I am making, and we get the benefits of the “whole” tomato! You can also add peppers, onions, garlic, jalepenos or whatever to different batches and label for your different meals to make meal time even faster. Grab from the freezer and go! I just buy a few cans of paste to have on hand for pizza sauce etc. or sometimes use my homeade sauce and cook it down. I started using this method after my 1st year at canning, got to say I prefer this way to the other, such a time saver for me! What about an all day crock pot full of tomatoes? I wonder if that would work if you have a 7 qt slow cooker? to go directly into the jars for processing. I heard from another relative that my great-grandma would cook her tomatoes on the stove for a little while, then set them in a cool place overnight. The next day she would pour off the “juice” that separated on the top and can it and then can the thick tomato sauce underneath the juice. That way she didn’t waste so much energy cooking down her tomato sauce and didn’t lose the juice. I wish I had her around now to learn from! I did my tomatoes a bit different this year. after washing,I started them on the stove, then, moved them to a slow cooker to finish cooking /roasting through the night. then, i put them through my little red italian tomato press/strainer. Afterwards, i canned and processed. It made me the richest sauce yet. My dream is to make and can huge batches of tomato sauce and salsa from veggies I grow myself in my own garden. My problem is I am definitely garden challenged. I have tried for several years in a row to grow the veggies needed for this. My plants grow beautifully, then they either start looking pretty sad, fruit starts, but doesn’t ripen or like this year we got so much rain ants took over and I was afraid to even enter the garden area. Oh well. Your sauce looks so yummy. Thanks for sharing this new way. Maybe one day I will get to try it. Maybe your local county agricultural extension agent could offer suggestions? Make sure you’re selecting tomato plants with a short enough lifespan for your area. Lowe’s & Home Depot won’t sell the varieties that are best for your climate – they just sell generic types. I buy my tomatoes from the 4H and FFA (Future Farmer of America) clubs at a nearby high school (I was shocked to learn we had these, since I’m in a large city). The varities these clubs sell mature within 60-80 days, which is perfect for the unpredictable nature of the Pacific Northwest. And, as an added bonus, the annual sale is a fundraiser for the kids’ clubs (ant the prices are so low!). This is my first year making sauce and I do it just like you! It is so easy I can’t get enough of it!!! I think this just revolutionized my opinion of canning! Thank you! Hallelujah! Now I may actually try canning tomato sauce. I can tomatoes, but have never tried to do tomato sauce because I didn’t want to spend hours cooking and stirring. I’m so glad to know that I may actually not need to buy tomato sauce next year! Thank you! My husband and I love to can. We made pickles (dill and bread & butter), diced tomatoes, salsa, and applesauce this year. We’ll have to give this sauce recipe a try. I noticed your pictures do not show the typical jar lids. Are those reusable? Where did you get them and how do you like them? I tried this, but ended up with tomato juice even though I strained the juices out (or so I thought). That is okay, though, because I’ll just use it to make chili. I think I’ll go back to just canning my tomatoes whole when more ripen. Am I reading correctly that it takes 35-45 POUNDS of tomatoes for 7 quarts of sauce? This seems like an awful lot of tomatoes for not very much sauce? Yes, it’s amazing how much liquid evaporates out to make the sauce! And it’s why I don’t make my own tomato paste. After trying a recipe recently that included roasted tomatoes (the best part of the recipe, in our opinions), I decided to try roasting the ones I was canning today. I loved that although it took a while to roast all of them I had, I didn’t have to monitor them all that closely. I am canning the sauce right now, after putting the tomatoes through my sauce maker (similar to a Victorio). Looking forward to the roasted flavor when I use the sauce! I just take my tomatoes(after washing) and cut the stem out, then put them through my juicer or food proccesor. Then I put the tomatoes, pulp and juice, in the jars, add a very little salt, maybe lemon juice and process. You can put everything into a crockpot/slow cooker and put a wooden spoon under the lid and let them cook over night to thicken. I don’y usually add many seasonings to the tomatoes. My grandmother did her tomatoes this way, then when she wanted sauce or juice or whatever she just made it when she opened the jar. AWESOME!!!!! Did this tonight with all the tomatoes on my windowsill. Thank you!! I am no longer in dread of all the blanching, peeling, seeding, blah, blah, blah.So easy. I was just inspired the other day to look up a roasted tomato sauce recipe cause it took me 3 hrs to blanch the tomatoes for my first batch of spaghetti sauce and it didn’t even taste that great. I did try the no blanching and blending recipe last year and didn’t really like the grainy texture it gave the sauce and again it didn’t taste all that great. I LOVE roasted tomato sauce!!!! It is so easy. I am sooooo glad I tried it and I’m glad you are posting about it so other people know that it is such a great way to make sauce. My mom actually made some using my method yesterday cause she too hate the traditional way of blanching and cooking it down. I cut my tomatoes up (about 1/2 bushel) and used 3 heads of garlic separated into cloves and pealed. I drizzled olive oil over it all, sprinkled with salt and pepper and roasted at 325 for 3 hrs. I had about half roma tomatoes so I didn’t drain mine before pureeing in the food processor and I still had a very, very thick wonderful sauce that tasted better than any jarred sauce I’ve ever had. I froze some and canned some. I didn’t add any herbs cause it was really good on its own but also figured if I wanted basil sauce I could add it later or add oregano and onion powder for pizza sauce when I needed it, etc. Try 500 degrees next time – you’ll get a bit more roasty taste. I just re-read Barbara Kafka’s recipe from “Roasting” and she roasts at 500 degrees for 10 minutes, stirs, roasts for 10-15 more. Cools, takes skin off with fingers, and mashes it all with her hands for a chunky sauce. I wonder if the skins in mine were a little more noticeable even though I vita-mixed because they were roasted at a higher temp? Anyway, the high temp roasting definitely gave it all a nice deep roasted flavor. Tried this today. It was great!! Thanks for making the process so much shorter! Thank you, thank you, thank you! This preggo mama did not want or need to be slaving over an oven yesterday making sauce, esp in HOT Phoenix. thank you so much for this!!!! I love canning my own tomato sauce but dread the process of making it on the stove in a big pot. I tried this today and it was fantastic! Such a rich flavor. They did not produce as much juice as I thought they should have, so I expected a runny sauce, but it was thicker than when I make it on the stove! This is my new favorite thing!! I wish I knew this idea a couple of weeks ago. I tried this method after homeschooling and got it roasting while worked on dinner. After dinner I blended in my Bosch blender and had over 7 quarts from a 30lb box of tomatoes before the night was over. This hardly felt like canning! I love your site laura, since I’ve been implementing bulk, unprocessed cooking like yourself, my best investment has been a Bosch mixer you would have a ton of fun doing your breads and blending. I got a bushel of romas and roasted them last weekend with some onion, garlic, and a little olive oil. The roasted flavor was amazing! I added a little Italian seasoning and canned it. I did not strain mine because romas don’t have much liquid. It turned out great! Thanks for the fabulous idea, Laura. You can use the leftover tomato juice that was strained out to make ketchup, in addition to canning the tomato juice itself (follow canning directions) for recipes that call specifically for tomato juice. I tried this over the weekend and it turned out fantastic! Thanks for sharing. What do you do with the tomatoe liquid you strain off after baking? You can disregard my question as I just saw a post where you answered my question about what to do with the liquid you strain off after baking. Amara, she is referring to the older comments where she said you can save the juice and can it to use in soups if you want to. This is just what I am looking for. I am going to try it. I found your apple pie filling recipe last year, tried it and it tastes great! I did have a problem during the canning process in that about half of the jars over flowed after I took them out of the canner. I made several batches and it happened each time. Any thoughts on what may be causing it? I am getting ready to can more apple pie filling this year, and am hoping to avoid the same result. I had this with canning apple pie filling last year. I processed the jars for the time needed. Then I removed the cannner from the heat. I left the jars in the canner for about 10 to 15 min for things to cool down a bit. I found that the over flowing was not nearly as bad this way. I would say that either your liquid is too thick or you are boiling the water too hard when you are water bathing. Your contents are over heating and boiling out of the jars. I often have this problem when I can applesauce and have found that I just have to simmer the after putting the jars in. in with your tomato sauce you need to pressure can it. A good resource is the USDA canning guide. Forgive me if I missed this information on your website. I don’t pressure can, just water bath with food items that are safe for that. (tomatoes, apples, peaches and pears) :) I need to edit my post and take out the part about throwing in other veggies because you are right, I have learned since writing this that water bath isn’t safe for that. Thank you for answering Laura! I’ve canned for years, grew up in a “canning household” my Mom did every imaginable thing, except meat, used the pressure canner as much as the WBC. However I never do anything that needs to be pressure canned, because I’m afraid of it!! Laura, can you also freeze this sauce? Totally impressed with the results of this method! I have followed your directions for applesauce and tomato sauce for a few years now… when you got the victorio, I had to have one too! Today was my first experience with roasted tomato sauce and the victorio. Very easy and perfectly yummy! Thanks so much! I wonder, can you use previously frozen whole tomatoes for this? Also wondering… Have several bags in the freezer, want to make sauce and then freeze it with the cooked meat and spices so it’s ready to go. Wondering if it would not taste good done that way? Anyone tried it? I found a website that shares how the lady did it, and she said it tasted great! It should work great using frozen tomatoes! I make a similar sauce but I coat the tomatoes in olive oil, salt and pepper and also roast chunked up peppers and onions and add to the pureed sauce however, my sauce, has to be pressure canned. I have also added onions, green chiles and cumin to the pureed sauce for my own enchilada sauce. This too, MUST be pressure canned. It must such a rich thick sauce that doesn’t need to be cooked down! I’ve never done any canning, so forgive me if this is a silly question. I usually make my spaghetti sauce by simply adding herbs and spices to a store-bought can of tomato sauce since we don’t like chunky spaghetti sauce. If I were to can my own tomato sauce as you’ve done above, could I add the spices before canning so that it would be all ready to go or would I need to add them when I go to use it? Yep, you can certainly add them while making your sauce and can it that way! I have been canning by putting all my jars on a cookie sheet and putting them in the oven at 275 for about 1/2 hour. I pull them out and listen to the beautiful popping. I’ve been doing this for 2 years now and it works beautifully. I learned this from a woman who has been canning for 30 years!!! This is an old method that has been proven to be unsafe. You should always follow the most up to date method in order to be safe. Just because it seals doesn’t mean that it has been cooked for long enough or hot enough to kill the bacteria that will cause your food to spoil. The Ball Blue Book or the USDA Complete Guide to Home Canning. You can get them both at your local extension office. This method isn’t safe, just because neither of you have gotten sick from this method dosen’t mean you won’t or can’t. 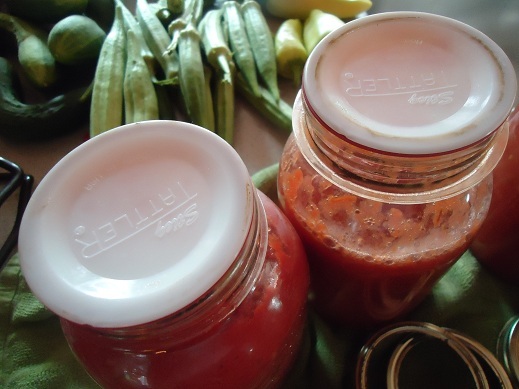 It is very improtant to use safe canning methods even if they are a bit harder. Water bath canning and pressure canning are the only methods proven to be safe if done correctly. Can you add green pepper,onion and garlic and still water bath can this? Hi Laura!! Thanks for this simple way to process tomatoes…starting it this morning. I do have one question: why do the tomatoes get strained after the roasting? Wouldn’t the juices from the tomatoes add extra liquid to the pureed skins? I do not have a lot of experience with canning so …just curious about this step. Thanks for any help and tips! There is quite a bit of runny, watery liquid after roasting, which is why it’s best to strain it off. It’s much like another method I sometimes use, which is cooking it on the stovetop and waiting for several hours until after all the liquid has steamed off. Roasting it and pouring off the liquid saves the time of steaming it off on the stove – either way, the liquid separates and is not needed for smooth sauce. Which sleeve did you use for the victorio strainer? The berry, pumpkin, or slasa?